Nice one. But I think there may be other difficulties. I’ve heard of people who have a stockpile of goods in case anything happens. Nice idea — but I don’t know where we’d put it all. She does have that look of panic on her face like she’s expecting the bomb any minute. LOL that’s an organised woman for you! Hahaha…well done for 22 years…after that? And all those fruits and veggies will keep them regular for 22 years, too. That food looks good, but 22 years is a long time to go with no Dairy Queen Dilly Bars. Some of my friends had thoses shelters, and they were stocked with years and years of food. Great take on the picture and so real! Hahaha better safe than sorry. 22 years is a bit long. I think I’d rather perish than be stuck with my family in a small space for that long! Ah, great minds! You and I had the same thoughts! How fun! Hope you have a great week, Quilly! After 22 years in a shelter I imagine some of the family members would be looking for jars with questionable seals! That is great, Thom! You are having a workout today. Quilly had better be greateful! I believe in storing up things, I have all kinds of stuff I don’t throw away. Just in case I ever use it? Better anwer would be where would I start on throwing away. Not like Mrs. Jim’s pantry. She orgainizes that fairly well. if i had to stay in a shelter for so many years, i’d rather be finished off by the bomb! i left my 140-character fiction in stonybrook because susan is having issues with volcanic ash. Sounds as if someone is having a “Blast from the Past”. Quilly, I hope Bill is wrong and there is NO blast! Nonetheless, when my dh bought his condo in Hawaii from an LDS couple, it came complete with 2 50-gallon barrels of red wheat. So — add those veggies, and a feast can be enjoyed! Oh my goodness. That is a great story for the photo given. I’m sure there are people today who have food and water reserved on their basement shelving for such a catastrophe. My dad had a storeroom stocked with whatever was on sale; traditionally this included Wheaties and toilet paper. I’ve had some blog woes and am a day late. Far more than a dollar short. But that story won’t fit into microfiction! Somehow my comment didn’t make it into my last post. Sorry. 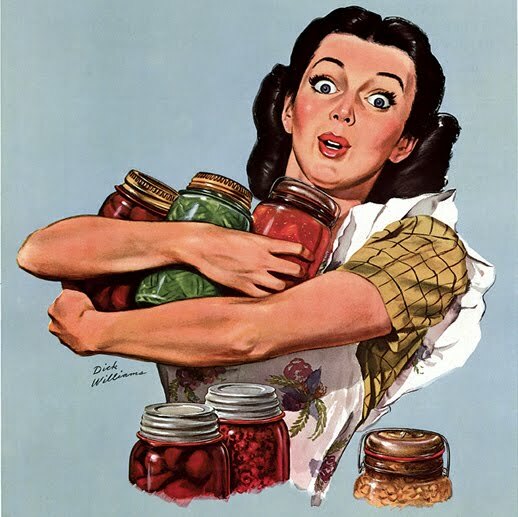 I loved your MM and could just picture a little shelter with all those jars. Or her families faces when they’re served the same old thing 20 years later!